Dogman is back again for more hilarious adventures. These graphic novel books are always in hot demand. I could buy twenty copies and still have children waiting to read them. They are brightly coloured graphic novels with quirky cartoonish illustrations and heaps of humour. Lots of tongue-in-cheek humour that parents will love too. Will he get a fair go in his latest adventure? Yes, the same author and illustrator that brought you Captain Underpants brings you funny stories about Dogman, half dog, half human. I love Brian Selznick’s books and have a number of them in my own collection. His illustrations are stunning and his books win so many awards. This time he is collaborating with debut author David Serlin. Baby Monkey, Private Eye offers humour wonderful illustrations; which you can peek at if you click on the Scholastic link above, and text suitable for younger readers. Mystery, part graphic novel, humour, and an adorable character all coming soon. Not out until February but this will definitely be on my list to purchase for my school library. The book trailer is so cute too. How can your resist such a cute creature? Looks like this could be a winner. Baby Monkey’s adventures come to life in an exciting blend of picture book, beginning reader, and graphic novel. What a brilliant cover. The blue is beautiful and bright and just calls for the book to be picked up. 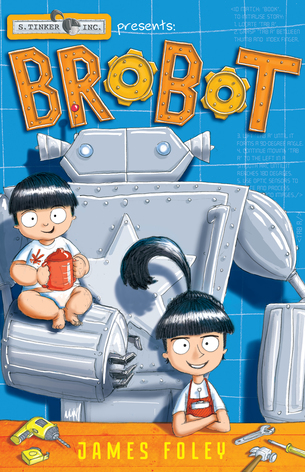 This is a great introduction the the graphic novel format for young readers. The very funny illustrations are broken up with just the right amount of text for newly independent readers. I love the very comical expressive eyes particular when Sally gets mad. They really are a window to the soul and in this case, Sally’s honest big-sister frustrations are quite obvious. This is very funny, especially for those readers with younger siblings. I mean who hasn’t thought of ways to dispense with, or swap a younger brother or sister – momentarily of course! Sally does find that her creation isn’t quite what she hoped for but her little brother seems to be totally oblivious to her plans and sits their looking perfectly cute. I do think this would make an ideal little series so I hope there are more adventures with Sally. An ideal book to encourage creative and makerspace thinking. Small things by Mel Tregonning @AllenAndUnwin This beautiful wordless graphic novel/picture book will leave you speechless. I have had this book at home for some time now but I have struggled to write this review. I struggled to find words that would adequately do justice to this book’s beauty. It is one of the most powerful books I have read in a long time. It is a wordless graphic novel for older readers and throws such a punch that I was left breathless. This book hits us with everything it has. Quality, beauty, sadness, hope all woven together with the most stunning illustrations. 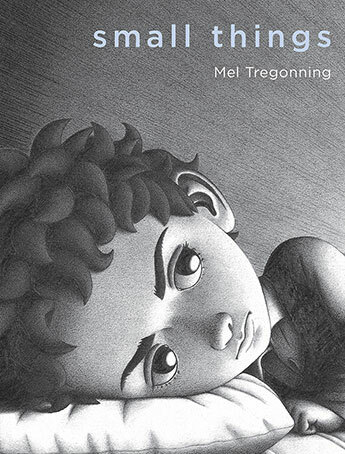 Mel Tregonning’s illustrations capture feelings with such honesty that it is at times confronting. A young boy is obviously so overwhelmed by his feelings of inadequacy and isolation that his world begins to fall apart. Indeed, it is the young boy himself who begins, bit by bit to crumble. His growing sense of sadness and loneliness is so raw and real it begins to eat away at him. At times when he is desperately trying to fit in, he fumbles, feeling others laughing at him and starts blushing. Despite the illustrations being black and white, Mel Tregonning captures his embarrassment through clever shading and we can feel his pain acutely. I so wanted to grab this boy, pull him out of the dark pages and his dark world, hold him close and hug him forever. He situation is so real and sadly all too common. However, there is also hope and the lovely sense of a friendship just starting to bud. I strongly believe this book is bound for all sorts of awards and deservedly so. It is with such sadness that the illustrator who died in 2014 will not be around to see the impact her beautiful book has had. Much has been made of the fact that Mel Tregonning took her own life but rather than focus on this I want to point out that the author and illustrator Shaun Tan illustrated the last three illustrations to complete this book. For me, this highlights the fact that at times we all need help and is one of the most powerful messages in this book. Yes, this book moved me to tears but it is a book and story we need to read. We need to talk about depression, loneliness, sadness and how to deal with these issues. It is not for young readers. I will restrict this book to year six only (10 years up). There is so much to unpack and discuss with this book. For teachers and parents it is a great book to use to begin those awkward conversations that if left unspoken, could become worse. Sometimes, all we need to know is that we are not alone and that others feel the same way we do. I love this book for so many reasons but mostly for its gutsy honesty and the message that we need to reach out, either for help, or to help. Teacher notes available here for both primary and secondary schools. Muddy Max is the first-ever slime-covered superhero who lives with his annoying neat-freak parents. With his savvy sidekick and his RC-driving, mountain-biking tomboy crush they face mysteries and danger with a heap of mud for good measure. In this first book in a new graphic novel series Max has to figure out who or what is lurking in the trees in the muddy marsh. And just maybe he can save a few lives at the same time. Sounds great for primary aged students who love a good mystery told in a quirky way in graphic novel form. Can just imagine the boys lining up for this one.